Ruth Barratt, A mixed methods study of the risk-taking behaviour of clinical staff towards routine use of protective masks for infectious diseases, Australasian College for Infection Prevention and Control 2018 Conference, Brisbane, Australia, 19–21 November 2018. Download the 3-minute title slide. presented at the Australasian College for Infection Prevention and Control 2018 Conference in Brisbane in November 2018. 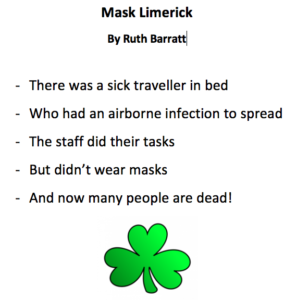 Ruth presented in the session for 3-minute presentations where she also recited a limerick – her original composition. Every year respiratory infectious diseases are transmitted within our healthcare facilities, often via infectious healthcare workers. Clinicians as vectors of disease have also been implicated in the spread of novel respiratory infectious diseases e.g. the hospital transmission of SARS in 2003 and MERS-CoV in South Korea in 2015. Wearing a protective respiratory mask is an infection prevention and control (IPC) measure intended to reduce the risk of healthcare associated infectious respiratory disease, yet research has shown that clinicians’ protective mask use is sub-optimal both in routine care and during a pandemic. My research addresses the gap in knowledge about the risk behaviour of clinicians towards protective mask use during non-outbreak settings and uses video-reflexive ethnography methods to determine the constructs of risk towards mask use. My presentation will add to the body of knowledge that can inform IPC practitioners in personal protective equipment training, policy implementation and pandemic planning.